New projects in the Student Project Bank! There are new projects in the SPB for dissertations, unit work or extra-curricular experience. Projects are available to all undergraduate and postgraduate students at BU and can be used for dissertations, assignments, unit, or group work. Broadstone Pantomime Productions is looking to overhaul their web presence to enable them to better market their productions and provide more information about the company to those who would like to be involved. Work with Broadstone Pantomime Productions to evaluate their current website, establish their needs and re-design their website. Broadstone Pantomime Productions is looking to update their brand. Work with them to evaluate their needs and establish and update brand including look and feel, marketing strategy and advertising. The Fable Bureau has been commissioned by Bournemouth Churches Housing Association (BCHA) to run their BChangemakers Campaign. It celebrates 50 years of providing services to vulnerable people across the South of England. Over the next 12 months they will be publishing stories on the campaign website of inspiring change makers in order to inspire others to make similar changes. This project aims to generate up to 15 2-2.5 minute films celebrating people that have made changes in their lives in order to inspire others to make similar changes in their own lives. These films will be posted on the BChangemakers website. Fable Bureau is open to discussion about the number of films. This opportunity is open to multiple groups of students. Algilez is an artificial language. The intention is that it could be used both for international communication and also within those countries which have a large number of local languages and whose development is held back by a lack of easy communication. In order to further promote the language we would like to provide a good quality mobile phone app to enable more convenient individual learning, as an alternative to conventional classroom learning. The app has already been created, but it needs improvement and some additional features. Research the best practice of existing online language learning apps to see what features could be incorporated into a mobile app and assist with the re-development. The Shine Project is a local registered charity working with young teenage girls in Bournemouth, Poole and Christchurch primarily in economically deprived areas. For the last 10 years Shine has impacted over 1220 young lives by running 8-week health and mental wellbeing courses. Their mission is to provide a friendly, non-judgemental, safe environment where overlooked teenage girls are able to connect with others, be active, keep learning and engage in mindful activities enabling the development of healthy physical and mental wellbeing. Every teenage girl deserves to recognise her value and potential. The Shine Project ran their first Health and Wellbeing Event in June 2017. The aim of the event was to inspire girls to think positively about themselves and encourage good physical and mental health. Over 200 girls from 12 schools attended, and 99% said they would go again. The Shine Project would like to run the event again in February 2019. Create a promotional video to encourage schools to send girls to the event. Send us an email to request a project brief and application form. The Student Project Bank is open for new project ideas! Do you work with an organisation in the community that wants to expand the work they do with our students? If you do, please circulate this call for projects. The Student Project Bank is a mutually beneficial collaboration between external organisations and our students. As part of their studies, our students get to work on a live project with the potential for real-world impact and external organisations get the opportunity to benefit from their knowledge, skills and creativity whilst gaining valuable insights into their specific project area. Projects are available to all undergraduate and postgraduate students at BU and can be used for dissertations, assignments, unit, or group work. Send us an email to find out more. There are new projects in the SPB for dissertations, unit work or extra-curricular experience. At the commencement of War World II the Air Ministry formed a secret department to oversee ways to fool the German Luftwaffe by using decoys and other means of deception. There was a decoy airfield on Lower Common, Three Legged Cross that simulated the flare path lighting of the local RAF Hurn & RAF Ibsley fighter stations as a lure to encourage attack by night bombers and intruder aircraft. Create an animation to help visitors visualise the decoy in operation at night and gain an understanding of how it was operated. The animation will be displayed in the Moors Valley Country Park visitor centre and online on their website and social media channels with the aim of encouraging members of the public to engage with history and heritage of park. It will also be the basis of an augmented reality app (see project SPB098). Bournemouth in Bloom is a voluntary group that encourages the residents of Bournemouth to take care of and have pride in their community. By improving our environment, we aim to make Bournemouth one of the most beautiful towns in the UK. Build upon the existing WordPress site to expand it into a resource for the local community that connects schools, Bournemouth in Bloom groups and partners in the community. Investigate the causes of homelessness in Bournemouth and how this affects those who experience it. Highlight all definitions of homelessness. Carry out qualitative and quantitative research via surveys and interviews and compile a report on your findings. There is the possibility of interviewing people who are liaising with local agencies and charities under the supervision of Citizen’s Advice. The aim of this project is to provide a fair representation of the experience of homelessness in Bournemouth. It will give a voice to one of the most vulnerable social groups, highlight local issues in the private rental sector and challenge stereotypes of homeless people. The results of this project will be used to inform the general public of the issues faced by vulnerable groups in society and to support Bournemouth Borough Council in working with these groups. Tomorrow’s People is in partnership with Borough of Poole, Health Education England and JP Morgan to support patients with physical or mental health symptoms which have prevented them from engaging with education, training, volunteering or employment. Referrals to the programme come direct from GPs and other local agencies across Poole, with no charge for participating organisations. Agencies such as Social Services, PCVS, Job Hubs and Jobcentre Plus use the service to offer additional impartial support in a ‘trusted’ environment, as part of a more tailored one-to-one approach. The programme has reduced the demand on Primary Care Services and at the same time has helped long term unemployed people to return to work. Produce a methodology and conduct an evaluation of the programme in the Bournemouth area. Provide a report of your findings. At the commencement of War World II the Air Ministry formed a secret department to oversee ways to fool the German Luftwaffe by using decoys and other means of deception. There was a decoy airfield on Lower Common, Three Legged Cross that simulated the flare path lighting of the local RAF Hurn & RAF Ibsley fighter stations as a lure to encourage attack by night bombers and intruder aircraft. Create an augmented reality app that will help visitors visualise the decoy in operation at night and gain an understanding of how it was operated. The app will utilise an animation of the decoy in action created for project SPB089. ‘Enriching Lives’ is a project that aims to bring together nursery and primary school children and McCarthy & Stone homeowners to participate in a variety of activities. The Enriching Lives project is intended to contribute to the debate about the benefits of intergenerational living, and to assist local and national government to formulate their plans for a more cohesive community and social fabric, whilst enriching the lives of McCarthy & Stone homeowners and children in the local area. Design and implement a strategy to assess the impact of the project on the McCarthy & Stone homeowners and the school children. The results of this study will be used by McCarthy & Stone in the process of deciding to roll out the Enriching Lives project across their properties. The Sports Ambassadors at St Mark’s Primary School want to create a media package (video presentation, advert) promoting how to live a healthy lifestyle. This includes showing what exercises could be done, how to prepare and eat healthy food and to generally promote healthy living. The children want to produce a package which would not only go on the school website but that could be sent out to other schools. Work with the Sports Ambassadors to create a video presentation and advert promoting healthy living. Wessex Entrepreneurs support, mentor and, if needed, raise funding for many types of enterprises through a substantial network. Assess the Wessex Entrepreneurs website and propose improvements to update the website. Present your proposal to members of Wessex Entrepreneurs and implement the agreed updates. Wessex Entrepreneurs support, mentor and, if needed, raise funding for many types of enterprises through a substantial network. Wessex Entrepreneurs are looking to expand their membership base and raise awareness of the events they run via social media. Design a social media campaign that Wessex Entrepreneurs can utilise to achieve this. Projects are available to all undergraduate and postgraduate students at BU and can be used for dissertations, assignments, unit, or group work. Send us an email to request a project brief and application form. The current website has limited functionality, is unattractive and paid members get limited benefits for their money. Benefits for paid members such as access to a confidential discussion forum and free webinars are underused. Carry out a baseline assessment of the organisation and members’ needs in order to make recommendations for adjustments to the website. Propose and implement changes to the website based on this assessment. The organisation is looking to encourage members to more effectively utilise the online content provided with their membership. Benefits for paid members include access to a confidential discussion forum and free webinars. Create an internal marketing strategy to increase the usage of the website by their members. This project can be undertaken in conjunction with SPB087: Marketing plan for a national healthcare society. The organisation is looking to increase the usage of their website by non-members. Create a marketing strategy to increase the usage of the website and raise awareness of the organisation. This project can be undertaken in conjunction with SPB086: Internal communication strategy for a national healthcare society. Based in Poole, Dorset, Harbour Challenge Outdoor Adventure Centre is a registered charity offering affordable access to a wide range of land and water based outdoor adventure activities to people of all ages, abilities and backgrounds. As a charity, the organisation relies on income from the activities they provide. Identify social media marketing opportunities to enable the charity to reach a wider audience and maximise their internet presence. Provide a list of recommendations on how this can be achieved as well as relevant marketing materials. The Leonardo Trust is a registered charity set up to make life a little easier for those who care full-time for others. Presently, The Leonardo Trust benefits 250 carers in Dorset per year. Their aim is to double this reach through paid advertising and marketing. Develop a marketing strategy to expand the reach of The Leonardo Trust to increase community engagement. The Happiness Course is an 8 hour course based on positive psychology and delivered over 2 or 4 weeks (or a weekend). Explore ways The Happiness Course can raise fund or attract investors in order to be able to offer the course to those who need it for a low cost. The Happiness Course is an 8 hour course based on positive psychology and delivered over 2 or 4 weeks (or a weekend). Compile a low-cost marketing plan to enable The Happiness Course to reach a wider audience in the local area. Include recommendations on how to implement the plan. RPM Digital Print was started in 1991 and has grown into a fully integrated print and multi-channel marketing communications service provider. Create two short videos (2 minutes each) to showcase the work of the company. The first video will introduce the company, their location and printing products. The second video will be based around their marketing technology. These videos will be featured on the website and on social media. Media and communications projects available! Evaluate how a small business could use social media platforms to achieve growth. Create a series of short videos to educate people around addiction and to promote St Swithuns Recovery Course. There will be the opportunity to work with the recovery ministry head, observe the course and to interview some members of the recovery course. These videos will be used as part of a national marketing and promotion campaign. Description: Create a social media strategy aimed at university students and parents of university aged children/ university students in order to raise the profile of QuietSphere Student Mentoring. Help connect millions of people to the help they need when they need it and allow millions to offer their help to those less fortunate or in need. Help-in is a charity that aims to create a new social media platform designed to increase volunteering both hands on and virtually. Design a social media marketing plan for a crowdfunding campaign and create a management plan for the marketing plan. Midlands Workplace Wellbeing Ltd works with employers to create happy and healthy employees through consultancy, training and health activities. Help Midlands Workplace Wellbeing Ltd rebrand the business as Mindful Workplace Wellbeing. They are looking to find a new identity that has impact whilst still remaining professional in order to increase their client base. Create a short video about good End of Life Care for healthcare professionals at Poole Hospital. Good End of Life Care should focus on helping people who may be approaching end of life to Live Well. The true definition of End of Life Care is “all of the care received in the last year of life” (recognising that this could extend to more than a year, or be shorter). By simply educating healthcare professionals in the definition of End of Life Care and highlighting that everyone who works in healthcare is in part responsible for delivering end of life care, we can improve care across Dorset. The video must be informative, but delivered in a very imaginative and fun way. The aim of this project is to provide better information about the village for visitors and members of the community. The information is to be both historical and current; i.e. an ‘interpretation board’ that explains the history, people and places associated with the village; and the ‘village plan statement’ located on the Parish Council website. This project will involve working with Bradford Abbas Parish Council and Bradford Abbas History Society. The Shine Project ran their first Health and Wellbeing Event in June 2017. The aim of the event was to inspire girls to think positively about themselves and encourage good physical and mental health. The event was held at Bournemouth Pavilion and had exhibition stands from 22 different organisations including local charities, youth services and businesses. In addition to the stands, the girls were encouraged to take part in one of the many different timetabled workshops such as drama, dance, music or mindfulness. Over the course of the day over 200 girls from 12 different schools attended and 99% of the girls said that they would do it again. The Shine Project would like to run the event again in February 2019. There are a variety of opportunities available including event management, marketing and communication, media production and audio visual. Stop Plastic Seas is petitioning the UK Government to introduce a national awareness day against the plastic in our seas. This is spearheaded by member of the local community who became concerned about the amount of plastic encountered in the sea when they went swimming. The project aims to raise public awareness and increase education around this problem in the local and national community. A national awareness day about plastics in the sea will provide an annual focus where all organisations and individuals against plastics in our seas can come together to raise awareness and collaborate. Formulate a plan to promote this petition so it receives more than 100,000 signatures by April 2018. Health and social care project available! Research and document the benefits an assistance dog can provide to a child with Autism/Down’s Syndrome and provide theories as to why the benefits occur, financial benefits for the NHS, Education Authorities and Social Services. The objectives of the project are to increase understanding of why benefits occur, to document benefits achieved through the provision of an assistance dog, potential financial benefits for local communities and promoting greater understanding and inclusion of Autism and Down’s Syndrome. Tourism, hospitality and events project available! Set up and monitor a field trial exploring the effectiveness of companion planting of Brassica species with a mixed regime of Brassica and Mint and/or Nasturtium in reducing pest-related crop damage. Produce a report on your findings. Computer animation and visual effects projects available! Create a 2-3 minute animation that highlights the key characteristics of adult children of alcoholics (ACOA) and conveys a message that they aren’t alone and that change is possible. Shelley’s Heart will be a downloadable app is set in St. Peter’s churchyard in Bournemouth town centre and features modern alter egos of Mary Shelley and the Romantic poets. As a Digital Research Animator you will be responsible for researching, designing, and developing 16 animated gifs (2-5 seconds in duration) to enhance the audio narrative. These are based on Photoshop illustrations that have been mocked up for the design document/script. Given the desired interactive element, you will be encouraged to research novel animation technologies including snapchat animations, augmented reality, and geo-location tracking. A design document will be provided however, you will have a role in refining the animation design. Produce a series of 2 minute animated films, each one based on the audio recording of a person’s story who has struggled with being HIV+. Each person will be from a different part of the world (Delhi, Boston, Pretoria etc.) for the Life In My Shoes (LIMS) international project. The people in these stories can’t show their faces because of the devastating stigma that still surrounds HIV. We are looking for an animator to realise the story in a creative and innovative ways, either by creating a character than doesn’t look like the interviewee, or finding some other creative way to tell the story. Computing and information technology projects available! Help connect millions of people to the help they need when they need it and allow millions to offer their help to those less fortunate or in need. Help-in is a charity that aims to create a new social media platform designed to increase volunteering both hands on and virtually. Work with Help-in to develop the above social media platform. All aspects must be scalable to cope with additions to details, projects, tick boxes and ultimately users. The Platform will be global, so there is a need to search for companies or project types in any part of the world. Harmoney is a not-for-profit organisation with a mission to help people to manage their money better, particularly so that it doesn’t cause worry, stress, or mental distress. Their initial service is providing advice on welfare benefits and debt problems. This project involved mapping the signing up user journeys of existing online current account and budgeting products, particularly those built for smartphones (like Monzo) and new innovative services (like Squirrel). You will be looking for similarities between the maps and assessing what works well and what doesn’t. These findings will be used to make recommendations for our product. Harmoney is a not-for-profit organisation with a mission to help people to manage their money better, particularly so that it doesn’t cause worry, stress, or mental distress. Their initial service is providing advice on welfare benefits and debt problems. This purpose of this project is to map the user journeys of existing online current account and budgeting products, to undertake tasks such as setting up regular payments, making transfers, checking balance. You will be looking for similarities between the maps and assessing what works well and what doesn’t. These findings will be used to make recommendations for our product. Harmoney is a not-for-profit organisation with a mission to help people to manage their money better, particularly so that it doesn’t cause worry, stress, or mental distress. Their initial service is providing advice on welfare benefits and debt problems. Map out security methods used by existing services of online current account products. What are the options? What direction might these tools be going in in relation to security? Are costs considered? What is the user preference? These findings will be used to make recommendations for our product. Cherry Tree Nursery is part of the Sheltered Work Opportunities project, a registered charity based in Bournemouth serving the local Community. We were set up to address the great need for meaningful occupation, in a supportive and pressure free environment, for adults with severe and enduring mental illness. Cherry Tree Nursery’s website is out dated and needs a revamp to bring it in line with modern website design and to attract new visitors to the charity. Business, management and marketing projects available! Investigate fund raising to support the development of a small business through crowdfunding. Examine current crowdfunding platforms and the feasibility of a low-cost DIY approach which does not involve a host platform. Research product licensing and discuss practical approaches, from initial contact to developing joint ventures. Make a list of recommendations. Employee Engagement Globally: What engages different people globally, from different geographic regions to different personas and job types. How do they want to be recognised, and what does recognition mean to them? Research trends in engagement DRIVERs per geographic region, job role and persona, as well as recognition recommendations for different groups. Create a social media strategy aimed at university students and parents of university aged children/ university students in order to raise the profile of QuietSphere Student Mentoring. Help connect millions of people to the help they need when they need it and allow millions to offer their help to those less fortunate or in need. Help-in is a charity that aims to create a new social media platform designed to increase volunteering both hands on and virtually. Carry out a feasibility study into crowdfunding models for charitable organisations and use your findings to design a three week campaign with a soft launch. There will be the opportunity to implement the campaign if desired. Help connect millions of people to the help they need when they need it and allow millions to offer their help to those less fortunate or in need. Help-in is a charity that aims to create a new social media platform designed to increase volunteering both hands on and virtually. Work with Help-in to develop their brand. This will be used to influence the look and feel of their platform and across social media, the website and any printed materials. Do you work with an organisation in the community that wants to expand the work they do with our students to a different subject area? If you do, please send them a link to this blog post, or this call for projects. Do you have an idea that could benefit society, and could use help to make it a reality? We are inviting community organisations, charities, not-for-profit organisations and corporate partners to submit projects to the Student Project Bank. The more ideas we have, the greater our impact on society. Why get involved with Student Project Bank? The Student Project Bank is a mutually beneficial collaboration between you and our students. As part of their studies, they get to work on a live project with the potential for real-world impact and you get the opportunity to benefit from their knowledge, skills and creativity whilst gaining valuable insights into your specific project area. You tell us about your idea and how we can help. We’ll work with you to develop your idea into an exciting project brief. We’ll then match your project requirements to our students’ skill sets. We’ll monitor your project progress and keep you up to date. The project results will be shared with you and we will ask for feedback on how it has had an impact on your organisation. There are new projects in the Student Project Bank! Projects are available to all undergraduate and postgraduate students at BU and can be used for their dissertation, assignment, unit or group work. Members of staff may also choose a project to set to their students. A complete list of projects is available here. Send us an email to request a project brief and application form. The Science Bus is coming to town! The Science Bus is coming! How clean is the air on your street, and can you measure this yourself? Do you know what lives in your yogurt? And how can you charge your phone when you don’t have access to electricity? We want to find out with you! The Science Bus brings you workshops and tools to find the answers to these questions and investigate the world around you. The Science Bus will travel across Europe in search of folk remedies until November 2017. A folk remedy is an everyday trick or “life hack” that anyone can use to make or fix just about anything. Some of this knowledge might even have been around for hundreds (maybe thousands!) of years. In partnership with the Student Project Bank and SportBU, the Science Bus will be hosted at Slades Farm Family Festival on Sunday 16th July and at Hengistbury Head Visitor Centre from 18th – 21st July. Come along and take part in a workshop! Why are we on a hunt for folk remedies? We’d like to put them to the test! How do these remedies work? What are the ingredients? What are the scientific principles behind them? And what can we do to improve them? By combining old knowledge with new technologies, we want to make these clever folk remedies accessible to everyone. The Science Bus is hosting workshops all around Europe to engage curious minds and encourage people to share their life hacks. The Science Bus will stop at festivals, campsites and marketplaces. In the workshops, our captains will investigate these folk remedies with you. They’ll bring along handy instructions and Do-It-Yourself (research) tools for you to build simple, scientific instruments. This is science for everyone! Why is the Science Bus important? We are so used to buying everything we need (and more) that we tend to forget that we can produce and fix things ourselves. We’re not sure exactly what’s in our food, where our products are made , what is right or wrong, or what our options are. Our goal with the Science Bus is to raise questions, encourage critical thinking and investigate our daily environment together. Why? We want as many people as possible to experience that making things themselves and gathering knowledge is both easy and fun! The Science Bus will be driving around Europe until November 2017: from the UK to Slovenia, Spain, Germany and many places in-between. The Science Bus captains will share their adventures and discoveries via our website and social media. Do you know any clever folk remedies? Share them with our captains or via our website so that everyone can make use of it! 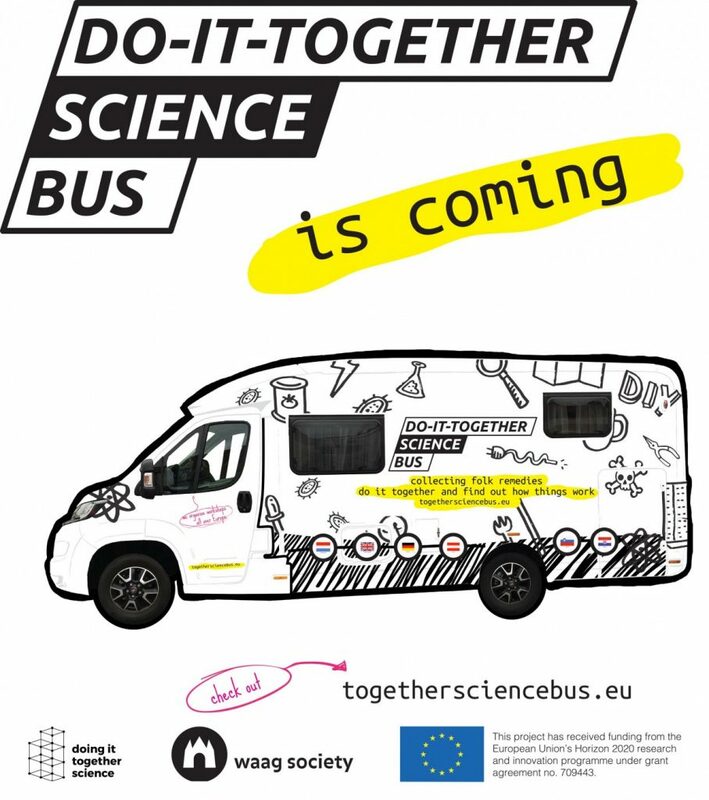 Get involved and follow the Science Bus via togethersciencebus.eu or #sciencebus and be sure to follow it on Instagram, Facebook and Twitter. Who is behind the Science Bus? The Science Bus project is realised by a group of enthusiastic makers from Waag Society – institute for art, science and technology – based in Amsterdam and is part of the European project, “Doing It Together Science.” Within this project, research institutions work together with science galleries, museums and art institutions to engage as many people as possible with citizen science. By hosting innovative workshops, exhibitions and activities all around Europe, the eleven partners show that citizen science is an accessible and fun way to explore the world around you. For more information check out togetherscience.eu. There are new projects in the Student Project Bank! Bundle is an iPhone app for local news readers. It works by aggregating local news articles from a variety of reputable sources and delivering the most relevant to users based on their current location. The app has the potential to revitalise the entire local news ecosystem. Bundle is currently available in the UK App Store but very little marketing has been done. Create a robust plan for the marketing of the app, with a focus on outdoor advertising and experiential marketing activities. Projects are available to all undergraduate and postgraduate students at BU and can be used for their dissertation, assignment, unit or group work. Members of staff may also choose a project to set to their students. A complete list of projects is available here. Send us an email to request a project brief and application form. New project with Poole Hospital NHS Foundation Trust in the SPB! There is a new project from Poole Hospital NHS Foundation Trust in the Student Project Bank! Nationally and locally, the definition of End of Life Care is subjective and confused. The term End of Life is frequently associated with the last days or week or two of life, at which point the focus of care is invariably limited to aiming to ensure a good death. Good End of Life Care should focus on helping people who may be approaching end of life to Live Well. The true definition of End of Life Care is “all of the care received in the last year of life” (recognising that this could extend to more than a year, or be shorter). There are new projects in the Student Project Bank from Bournemouth CVS and Midlands Workplace Wellbeing! Short project briefs are listed below and full briefs available upon request. Design and implement a marketing strategy to help raise the profile of the BYV awards through marketing materials and social media. There will need to be tailored promotion around ‘volunteer week’, a week long series of events and an award ceremony celebrating volunteering. Projects are available to all undergraduate and postgraduate students at BU and can be used for their dissertation, assignment, unit or group work. Members of staff may also choose a project to set to their students. Short briefs are listed below, full project briefs are available upon request. Create a 2-3 minute animation that highlights the key characteristics of adult children of alcoholics (ACOA) and conveys a message that they are not alone and that change is possible. Noc’s Box uses Gaming (PvP-face-to-face; Skirmish/Warhammer/Empire of the Dead…; and Role Play games) to help people with high social anxieties such as Asperger’s and other social communication/mental health issues to meet in a safe, supportive environment and, through the medium of gaming, to develop their confidence, communication and other life skills. Noc’s needs to reach more potential customers/users both in order to sustain the current business and our clubs and, vitally, to help to convince potential funders to sponsor them as a newly-formed charity. Create a marketing strategy for Noc’s Box with specific recommendations. Noc’s Box uses Gaming (PvP-face-to-face; Skirmish/Warhammer/Empire of the Dead…; and Role Play games) to help people with high social anxieties such as Asperger’s and other social communication/mental health issues to meet in a safe, supportive environment and, through the medium of gaming, to develop their confidence, communication and other life skills. Noc’s needs to reach more potential customers/users both in order to sustain the current business and our clubs and, vitally, to help to convince potential funders to sponsor them as a newly-formed charity. Produce a short (3 minute) promotional video for Noc’s to use to promote the charity. Projects are available to all undergraduate and postgraduate students at BU and can be used for their dissertation, assignment, unit or group work. Members of staff may also choose a project to set to their students. A complete list of projects is available here. Send us an email if you would like a project brief and an application form.